Unfortunately, the VA released that they still have no definite date for awarding benefits to those veterans who flew the C-123 aircrafts. Those who flew C-123 aircrafts between the 1970’s and 1980’s are not entitled to any benefits regarding Agent Orange. A recent study showed that these reservists may have been exposed due to leftover residue of herbicides in the C-123 aircrafts. 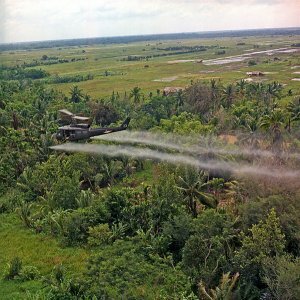 The C-123 aircrafts were used to spray millions of gallons of dangerous herbicides during Operation Ranch Hand in the Vietnam War. Agent Orange has caused many life threatening conditions over the past 40 years. If the VA makes a decision to award benefits to those flying the C-123 aircrafts due to residue exposure, many veterans will get the help they deserve. What are your thoughts on awarding benefits to over 1,500 people who trained and/or flew on the C-123 and were exposed to Agent Orange? For more information on Agent Orange and the signs and symptoms of exposure visit /types-of-injuries/#toxic.